Portland, OR and Helsinki, Finland – 29 October 2018 - Puppet, the standard for automating the delivery and operation of the software that powers everything around us, today announced its partnership with leading Nordics DevOps house, Eficode. 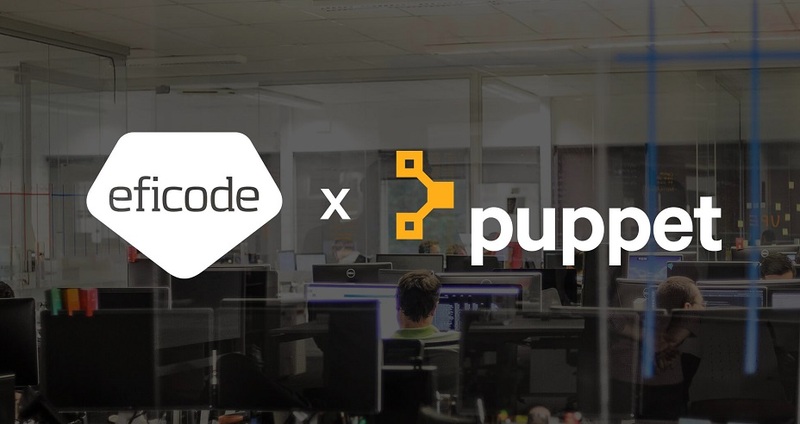 The partnership will open up the full suite of Puppet products to Eficode customers and will support them at every step of their application deployment and automation process on the path to delivering outstanding digital experiences. Using Puppet’s range of tools, Eficode is enhancing its capabilities to advise customers on the creation, design and deployment of new applications. This fits seamlessly into the organization’s ongoing mission to enable high-performing software-driven organizations to build outstanding digital experiences. As a Gold Partner, Eficode will benefit from access to the full range of Puppet products, including new and upcoming developments and a range of Puppet sales and training resources. In addition, Gold Partners receive additional NFR (not for resale) licences, as well as access to the partner advisory council, and additional promotions. Puppet is driving the movement to a world of unconstrained software change. Its revolutionary platform is the industry standard for automating the delivery and operation of the software that powers everything around us. More than 40,000 companies—including over 75 percent of the Fortune 100—use Puppet’s open source and commercial solutions to adopt DevOps practices, achieve situational awareness and drive software change with confidence. Headquartered in Portland, Oregon, Puppet is a privately held company with more than 500 employees around the world. Learn more at puppet.com. Eficode is building the future of software development. Companies who are partnering with us and use our DevOps platform and consultancy services will become high-performance software organizations and reap significant business value. Eficode Root DevOps platform is a complete, state-of-the-art software production line, tailored to perfectly fit your organization’s needs. It comes as a turn-key solution with flexible options for support, maintenance, hosting and continuous production line development. Eficode is a privately held, fast-growing international company with more than 250 employees. The company is headquartered in Helsinki and with multiple branch offices outside of Finland.